Zolon Tech, Inc. (Zolon) headquarted in Herndon,Virgnia, is a rapidly expanding IT and managed services company providing federal and commercial customers with innovative solutions that meet the most demanding requirements, including agile application development, big data collection and analytics, everything as a service, mobile integration, and staffing and vendor management. With deep experience in the federal and commercial markets, Zolon is unique in its ability to integrate best practices and implement proven solutions that consistently beat deadlines, come in below cost expectations and exceed mission requirements. As we grow, Zolon continues to maintain the mindset, hunger and culture of a small company. Our leadership still plays an active role in every project. Our subject matter experts realize they only remain experts by continuing to push the boundaries. Together, we are keenly aware that success comes through teamwork and that our clients are the most important members of our team. We have streamlined our processes and eliminated bureaucracy so we can respond quickly, easily integrate new technologies and maintain lasting partnerships. 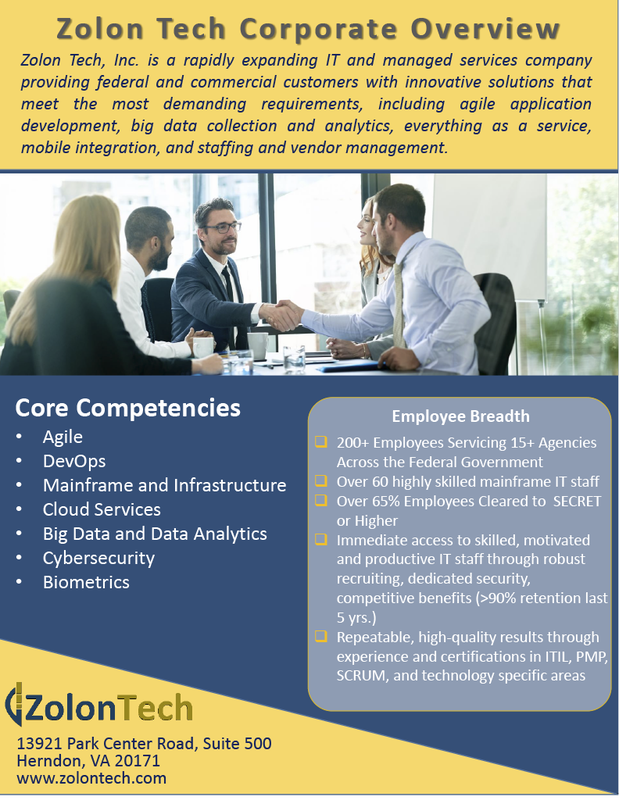 When you consider our experience, our people, our processes, the quality of our solutions and the deep respect we have for our missions, you will find that there are many benefits to working with Zolon.